Chronometer testing in Switzerland took place at observatories in Neuchtel (1866 - 1975) and Geneva (1873 - 1967). and regulated pieces. A manufacturer might submit a few watches, then report the best results in advertising. The few watches that were actually tested were rarely sold to the public. agencies were founded between 1877 and 1956, and each operated independently of the others. was located in La Chaux-de-Fonds, and offices were located in Le Locle, Bienne and Geneva. By way of summary, watch manufacturers send batches of uncased movements (not watches) to the COSC for testing. Reading and Understanding the Modern COSC Certificate. number of the movement tested. In the example, 102472. 30.00 millimeters in diameter and 7.55 millimeters thick. Looking at the column from left to right, the first column is the days, 1 through 15, over which the test was conducted. Fahrenheit, 8 = 46.4, 23 = 73.4, and 38 = 100.4. (or where 12 o'clock normally would be). the rate was -0.7 seconds, or slow by 7/10 of a second compared with the reference. and M2 are used because they are two 24 hour testing periods under identical circumstances (position and temperature). Similarly, M3 is 1.9 and M4 is 2.8, so the difference reported in Column 5 is 0.9.
sometimes place movements in a vault upon return from the COSC, to be cased at a later date. 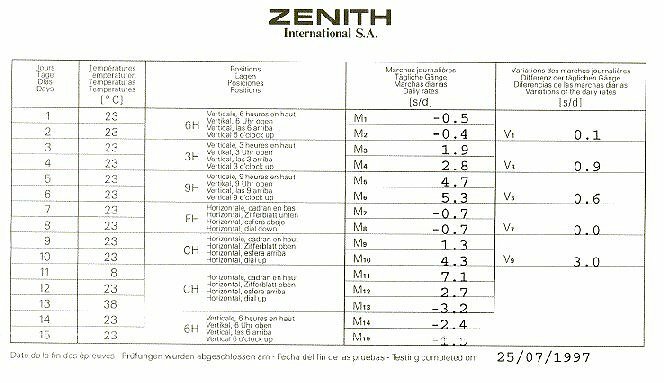 The important numbers are found at the bottom of the certificate, shown below. These are the Results or Summary. pass. Manufacturers are free to re-submit movements that fail. The bottom section of our sample certificate is set forth below. A description of the tests and calculations follows. then divide by 10 to get the result (1.8 in the example). To pass, the mean daily rate must be -4 to +6 seconds per day. are the COSC guidelines". As we'll see, these two figures are only the tip of the iceberg. Osterhausen states at page 59: "the lower the daily rate, the more accurate time a watch gives." 2. Mean Variation, or mean daily rate variation in 5 positions. This test is sometimes referred to as rate deviation. tends to run fast, slow or correct, or perhaps both fast and slow; in other words, the continuous rate of the movement. regulated, and so the error is more easily eliminated. in any position. To pass, the greatest variation in any position cannot exceed 5 seconds. vertical position (first and second days) from the average of the rates in the horizontal position (ninth and tenth days). between mass produced and hand adjusted movements. This figure tends to be lower for better quality movements. mean daily rate (the figure reported in test number 1) and any individual rate during the first 10 days of positional testing. 6. Variation of Rate per 1 Centigrade. This is the temperature error of the movement, expressed in seconds per degree. The COSC subtracts the cold temperature rate (8 degrees) from the hot temperature rate (38 degrees) and divides by 30. In the sample certificate, the rate at 8 degrees was 7.1, and at 38 degrees it was -3.2. So -3.2 - 7.1 = -10.3 30 = -0.34. To pass, the variation cannot exceed 0.6 seconds per day. from the mean daily rate of the last test day. To pass, the resumption of rate can be no more than 5 seconds. 7. rate resumption of -5 seconds minimum to +5 seconds maximum. re-assembled, oiled and regulated, then cased. This can certainly affect the movement's performance, yet re-testing is not required. moving between the two? Is the watch placed on a winder? How is the winder set? Each of these also affects performance.